GoToMeeting is as powerful as its competition, but at a more affordable price. However, Mac users will be slightly disappointed by its bland interface. At a certain point, teams and companies outgrow used consumer-grade solutions for conferencing online. Products like Skype, Hangouts, and Facetime aren't meant for heavy usage, and often balk once you get an hour into a conversation. This is where solutions for the enterprise have filled an important gap. Citrix's GoToMeeting is a video conferencing client available on desktop and mobile, as well as some wearable devices. Adobe has their Connect service, and Microsoft has Lync Server 2013 (prices vary for both), but GoToMeeting's closest competitor is Cisco's WebEx solution, which is slightly more expensive, with a very similar set of features. GoToMeeting is free for up to three attendees, $39/month (about £30/AU$55) billed annually for up to 25 attendees, and $56/month (about £40/AU$70) billed annually) for up to 100 attendees. WebEx on the other hand has the same free-for-three offer, but costs $19 per month/annually (about £12/AU$23 $24 (about £15/AU$29) for eight users , $39 (about £25/AU$47 per month/annually for up to 25 users and $69 (about about £44/AU$83) per month/annually for up to 100 users. For larger teams, Citrix offers GoToWebinar, which prices at $79/month (about £50/AU$95) billed annually for up to 100 attendees, $319/month (about £203/AU$382) billed annually for up to 500 attendees, and $399/month (about £254/AU$478) billed annually for up to 1000 attendees. For interactive training for teams Citrix offers GoToTraining, which prices at $119/month (about £76/AU$143) billed annually for up to 25 attendees, and $279/month (about £178/AU$334) billed annually for up to 200 attendees. Those price-structured packages are not only per month, but per organizer - the account that manages and schedules events. Attendees who don't need to make accounts or sign up are sent a link to join a meeting, which happens through either a web browser, the GoToMeeting client, or by calling in to a toll-free number. Of course, GoToMeeting allows for the call audio to go through its client, thanks to VoIP integration. Cisco may have name recognition, but Citrix competes through feature parity and being better on your bottom line. With an in-app text chat room, screen sharing, and their always evolving labs features, Citrix, which acquired this platform in 2003, is continuing to adapt video conferencing to today's technology. Functional across a diverse array of devices, GoToMeeting is a solution very much worth considering. Reviewing GoToMeeting, I was able to test the platform on a wide range of devices, a standard in the industry designed to leave no team member with an excuse for missing out. It didn't matter which web browser I used, GoToMeeting was built around Flash, and now supports HTML5. While the market for this solution is based around PCs in the enterprise, I was able to present and attend meetings from both my Macbook Pro and my iOS devices. Also, it's available on Android including any Android smartwatches that support Android Wear. Of all the options, the PC is the best for presenting, thanks to the white-board presentation app Sightboard, as well as an ever-expanding set of Labs features. Starting a meeting and sending out invitations was a quick and easy process thanks to integration with Outlook and Google Calendar. After starting a meeting with a single click, GoToMeeting gave me a simple invitation to send out. Up to six computers, including my own as the presenter, are allowed to stream from their webcams simultaneously. Over the years, having sat through stuttering Google Hangouts meetings and Skype calls that repeatedly freeze and lose image quality, I have to credit GoToMeeting for making a very strong case for a paid solution. In one of my tests, I had an hour long conference on GoToMeeting that went by without any snags or drops in quality. While I was impressed with the A/V quality, GoToMeeting lets me share my screen with the attendees. If someone I was working with wanted to share their content, I could pass the presenter baton to them, and if someone had an idea for a change they wanted to make, I was able to give them remote access to my mouse and keyboard. I was also able to test out GoToMeet.Me, their new product for personal GoToMeeting rooms. 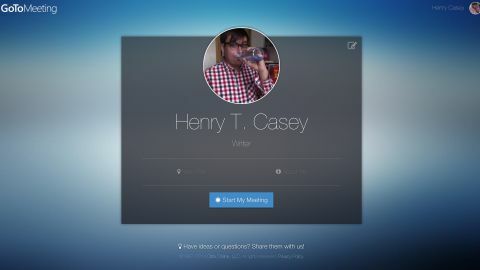 I filled in simple forms to create my profile page with a distinct vanity URL, GoToMeet.Me/henrytcasey. Then I was able to place that in my email signature, so that my correspondents have an easy way to jump into a meeting room with me.